On Tuesday I came across what was probably the biggest pile of trash I had ever seen, and I mean it. The garbage extended even further than this picture shows. I spent a few hours looking through boxes and boxes of… things. Some other people, including a couple of older women, were there even longer than I was. It was incredible, and what happened later was quite interesting as well. I think an older woman must have passed away. There were lots of beautiful old photos and mementos that no one throws out unless they’re not around to see it. However, there was a problem: she also had bedbugs. I discovered this close to the end of my stay. I heard the superintendent talking to some people about “punaises.” I went and checked out the old mattress and saw a bug. I usually check for them earlier but the sheer immensity of the mound of trash distracted me. I had planned on being careful regardless, but when you actually see a bug you have to really be careful. I dumped some stuff I had planned on taking, including some old pictures and sewing patterns. I could have baked them and it would have been safe, but I didn’t think it was worth the stress to do so. I ended up leaving with jewelry and dishes, or things I could easily clean. When I say jewelry though I mean a whole plastic shopping bag full of jewelry. I didn’t see immediate signs of gold or silver, but I did see some rocks that had a bit more glisten to them than the usual jewelry I find. I wondered if they were diamonds. I walked my bike back home with these things (and some previous finds) in tow. The jewelry was in small bags inside a larger bag. I decided the best way to stay safe was to sort through the jewels on the sidewalk, putting them in a new plastic bag so that I brought as little inside as possible. Once inside I’d bake the jewels at a high enough temperature to kill bedbugs, which isn’t particularly high. I probably looked a bit sketchy rummaging through jewels on the sidewalk. I had finished sorting and was about to go inside when I saw a police car come the wrong way down my street with their lights on. They walked into the laundromat nearby. I was planning on washing everything I was wearing and I casually followed them into the laundromat, intending to put my jacket in the washer right away. When I heard them asking about someone with jewelry I was completely honest and told them the entire story. They asked to see my bag of jewels and I showed it to them. I told them where I found it, why I was being such a weirdo, my information and so on. At some point they looked at each other and shrugged, not knowing what to do. They left – and they just walked away with my bag of jewelry. No explanation. It definitely sounds (and feels) a bit silly in retrospect. I should have been more critical and at least asked as to what they had planned to do with the jewelry. I think I normally would have. However it’s hard to communicate the sort of mood I was in. Going through boxes and boxes of interesting trash for two hours (and having biked around for an hour and done some spring cleaning before that) was an exhausting process. As well, poking through the numerous possessions of someone’s life is humbling; it reminds you just how important it is to live life to it’s fullest. It forces you to acknowledge that we’re not around forever and to cherish what we do have. When they left with the jewelry I can honestly say I didn’t really care at all. Maybe they sensed that. I had faith it’d all work out in the end, and was happy enough not to have to worry about cooking jewelry (even though I was confident it was fine either way). However, I am curious as to what exactly happened. From my understanding garbage picking in Montreal is not illegal. I’ve never had problems before and the police had hours to stop me, a few old ladies and other people from searching through that massive pile of trash earlier in the day. No one showed up. I plan on calling the police department / 311 tomorrow to get more information. Maybe I can get the jewelry back, or at least find out exactly what went down. I’ll let you know how it goes. On the plus side, the dishes that the police didn’t take are beautiful! It’s all “Tenderness” by Royal Albert (a part of Royal Doulton). It’s all in great shape – not a single crack or chip. I made sure to clean it all at a temperature sure to kill any bugs, even though they don’t tend to take refuge on plates. It definitely has some value and I think I’ll try to sell them on Ebay. It’s sad to see entire lives disappear at the drop of some garbage on the street. It makes you wonder if the young boy in the photos is dead too. Nobody left to care. And to think she lived her last days alone, plagued by insidious bedbugs. Curious indeed. A jewellery heist … by the police! Did you mention the little bedbug detail to them before they ran off with their loot? Nice group of dishes. Someone might buy them who’s looking to complete a set. I’m curious about the previous finds you collected before coming across this massive dump of stuff. I presume you’ll do another post of those? 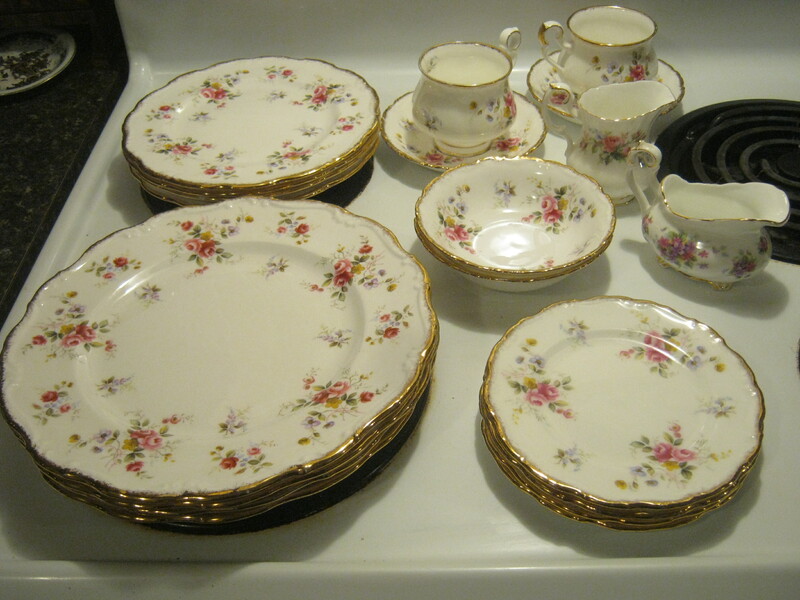 Very lovely dishes…around here they sell very expensively at antique stores. Oh my god. I’m a bit scared about the bedbugs. I brang the box inside my apartement to put it in a garbage bag and I planning to left it outside. I hope during the 2 minutes I left the box, the bus didnt had time to go out free in my place. And what about my car… Grrrr I think I’ll throw everything out again. Even if I dont keep a thing a found, that bi amount of trash was one of the biggest I’ve ever seen. This was an amazing hour. Sorry for my rusty english. It was a pretty amazing pile of trash. I wouldn’t stress too much about the bugs. I’m often paranoid that they jump around and stick on you if you even touch them, but they actually seem to stay motionless. You might be okay. Even if you did happen to get bedbugs, at least you know extremely early on and it would be very easy to treat. As for the stuff you took, it should be fine if you put the clothes in the dryer for a while. For other things you can bake them / wash them in hot water. Eggs and bugs die when their internal temperature get to 120 degrees Fahrenheit, so if you put your stuff in the oven on the lowest setting or wash it with hot water (though you might want to add boiling water to make sure it gets to that temperature) the things will be okay. Thanks for the checking out the blog! I think there is a bylaw against taking things from the garbage, but obviously not enforced. Back in 1999, there was a big fuss, the City of Montreal wanted all garbage to be in those big green plastic bags, rather than in tiny grocery bags which was often the case. So there was a new bylaw passed then. I think I’ve noticed the effect, less left out in the open, more green garbage bags, so you do have to open bags if you are looking hard for things. I’m sure it was 1999, and there was an article in The Montreal Mirror about the new bylaw, about garbage rules. I don’t know if their archive is still online, a search didnt’ show anything. But, I’m sure that article also said something about how taking things out of the garbage is actually illegal. You ought to check. Some of the justification seemed to be that reclaimed items from the garbage could be used to offset the cost of garbage, or something like that. That said, I don’t if it is a law. I think your specific case was unrelated to where you got the jewelry. Someone saw you sorting it, and called the cops. I suppose even the cops could have been driving by, and then backed up to check again. Sorting jewelry in public does seem a tad suspicious, maybe you did steal it. And I’d think that was the issue. You have no proof that you found it, or that it belongs to you, so they want to make sure nobody puts in a claim. Maybe. It seems odd, my experience is that they’d haul you in rather than give you the benefit of the doubt. You don’t give full details, but from what you say, I suspect they are holding it for a fixed amount of time, to see if anyone claims it. Kind of like finding money and turning it in, at least folklore says that they’ll hold it for some time in case someone claims it, then if not it’s yours. It can’t be because you found it in the garbage, unless they were actually following you from the pile of garbage. Thanks for the information. I did consider that they may be waiting for someone to claim it. They do have all my information. Maybe there was a miscommunication – my French isn’t too great (though I spoke French and they spoke English much of the time). Who knows! I’m not angry or anything, but it’d be nice to check out that jewelry a bit more. I still have to call them but I may have to wait until later. Bedbugs do not kill anyone;bedbugs is no excuse to dump jewelry.Trash-picking is not in practise illegal because I have friends in New England who do it too.Bedbugs ain’t an excuse to throw out family photos. It can be illegal to throw out someone’s jewelry and personal souvenirs ,even if they are dead.Did the dead person not have an estate executor?What if family members later decide to sue the superintendent for throwing out valuables?This has happened in the US and elsewhere,and heavy damages have been paid.I am shocked;bedbugs are not even shocking in comparison. I’m not sure. It’s always possible she moved to a nursing home as well. 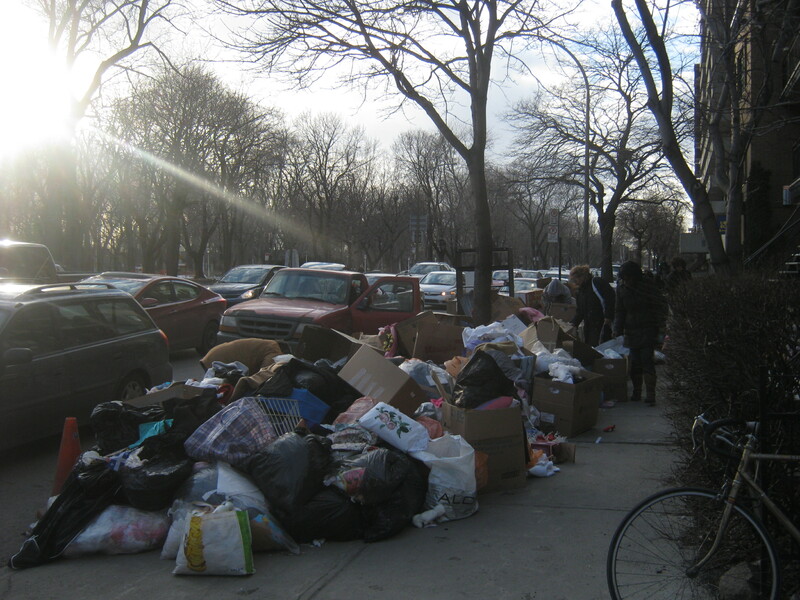 Still, this was a ridiculous amount of stuff to find on the street, most of which could have been easily cleaned of any bedbugs. 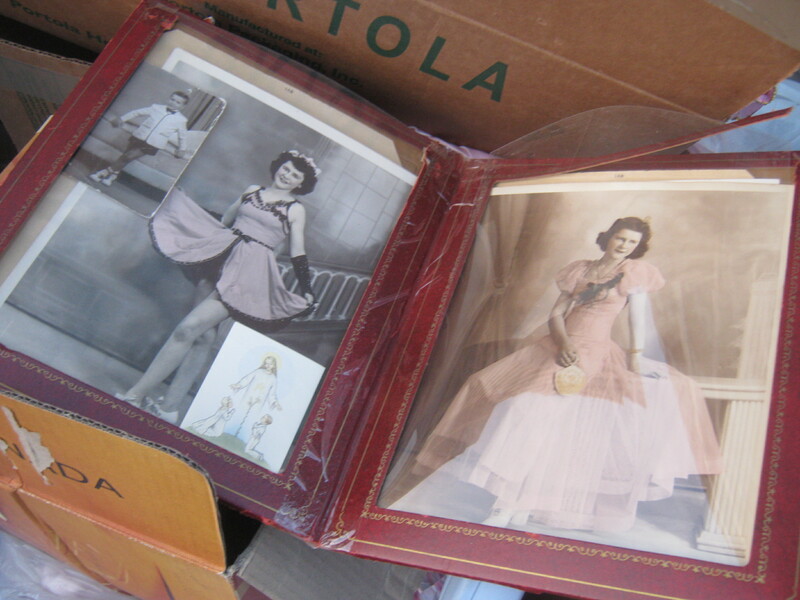 She definitely hoarded, but some of the personal photos were gorgeous and it was hard to believe anyone would throw them out. It’d be interesting to know the back story. There was lots (!) of clothing, dishware (she seemed to have many different types), books, food from the kitchen (cans, spices, etc), and the keepsakes, decorations and bric-a-brac one accumulates in a lifetime. Beyond was some furniture – not a lot considering how much trash there was. There were some beautiful old drawers but they were all busted up. 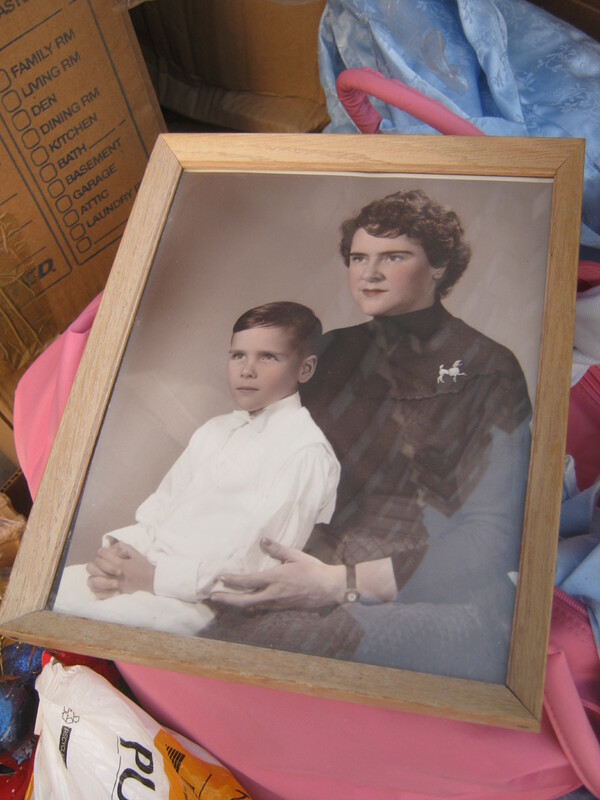 My grandmother had a very large collection of knicknacks and books.When she died,before the house was sold, most of the furniture was divided between family members,and 80% of the books claimed by the children,grandchildren and friends.20% of her stuff and many clothes were sent to the Salvation Army.She was never considered a hoarder;the word ‘hoarder’ is used overmuch,Martin.Martin you should have taken the books too;books do not carry bedbugs most of the time. If the woman was being moved into a nursing home,could her executives or relatives not hold a garage sale or moving sale?Why throw out dishware,books and knicknacks in the garbage?If she was dead,why did relatives not rescue the photos,jewellery and knickkacks before throwing out bug-infested clothes?This is simply crazy,crazy. What percentage of the stuff was rescued and taken by strangers before the garbage truck came?Any clue?How much further than is seen from the photo did the pile of trash extend to?You should have taken and posted another picture.All of your entries are good and well-written;this is the most poignant and heart-breaking.It makes me respond.It is shocking and unbelievably sad! A fair amount was taken but nothing close to the total. Someone actually filled a whole truck full of stuff (you can see the truck in the picture). It extended far past those people on the right hand size, ended in another section for the furniture. I would love to know the back story of this woman.If you find out,please publish it. I would’ve gone bonkers over the clothes! But you know how I am! Also all these amazing vintage photos! What an inspiration for a designer!